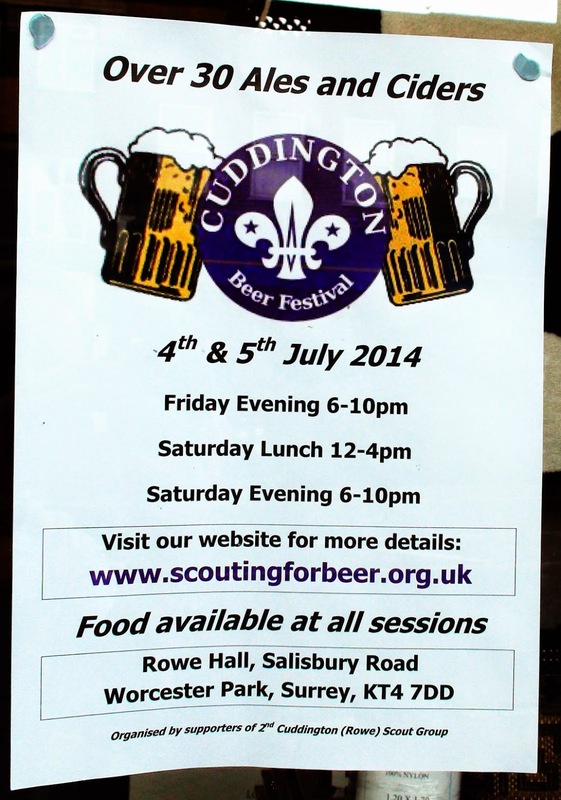 ...And while we're on the subject of Scouts, festivals and raising money - with the addition ingredient of "drinking beer" added to the mix we get the Cuddington Beer Festival! The festival, which has already enjoyed one session last night is on from noon today until 4pm and then starts again at 6pm for the evening session which goes through until 10pm. It can all be found at the 2nd Cuddington Scout Headquarters, Rowe Hall, Salisbury Road, Worcester Park, KT4 7DD. There are 34 Ales and 18 Ciders to try - I'm not sure if there's a prize for getting through all of them, however if you're keen to make a valiant attempt while supporting the scouts get yourself along. There is also excellent food from B.Radford & Son Traditional Family Butcher and live sport on the telly. Is there nothing they haven't thought of? Tickets are still available on the door, at www.scoutingforbeer.org.uk or at Radfords in Stoneleigh. Cometh Beer O'Clock, cometh the beer.